'Wayfarers' is on a prestigious community still surrounded by the natural beautiful settings of central florida yet within 15 minutes of Walt Disney World. If you are looking for something special 'Wayfarers' is the ideal place to stay for your dream Floridian vacation. Your every comfort has been catered for and we are sure you will be highly delighted with the stunning interior and additional facilities making 'Wayfarers' a true luxury holiday home! Just minutes away there are restaurants also offering take away/delivery service, large supermarket, pharmacy open 24 hours and many more facilities. 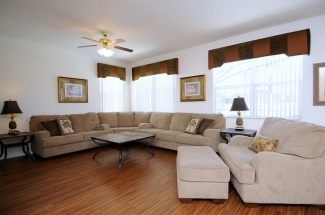 Access to the main motorway 1.4 is less than 5 minutes and then Orlando is yours to explore! With over '2500 sq.ft' of space you will find this is one of the largest four bedroom homes and has the added benefit of TWO! lounges - the family room with a huge comfortable sectional sofa and an additional a one and a half chair and footstool, certainly big enough for all the family to gather round and watch the 56' HDTV with over 200 chnnels including premier football matches or a DVD. Or the elegant formal lounge/dining room where you may even get time to finish that book! The lovely fully equipped open plan kitchen & breakfast room allows you to always be fully included with the rest of the family as they play in the pool or relax in the family room. There is also an IPOD docking system so you can listen to your latest downloads. Having a south facing pool is a priority and will guarantee to bring a smile to your face. From early morning you will be able to make the most of our overlooked beautiful pool area and enjoy alfresco dining in the Florida sunshine. The 28 x 14 pool has an extended deck allowing plenty of room for the extra chairs with foot stools and room for everybody to enjoy themselves. The bronze tinted screen and landscaped gardens make a lovely backdrop over the open grassed area to the rear. When you eventually retreat for the night the fantastic King Master Suite will bowl you over as you enter through the double doors. The sumptuous 7 foot bed awaits surrounded by elegant soft furnishings, full ensuite, TV and DVD player. The equally welcoming Queen Suite with soft furnishing in gentle tones will help soothe away those busy day feelings. With its own ensuite, just put on the new flat screen TV or relax with book and don't worry both rooms have walk in closets for all those Florida bargains! The comfort and high standard continues in the lovely twin rooms both with televisions and PS2 with games & DVD player between them. There is ample wardrobe space a full bathroom with the added benefit of double sinks to speed up the morning rush for the Parks. For added fun and entertainment we have provided a games area with Air Hockey/Pool Table/Foosball & Electronic Darts. There is a fitted ceiling fan and child friendly flooring so everyone can join in the fun. 'Wayfarers' comes with cable TV/FREE high speed wireless internet/COMPLIMENTARY LAPTOP/PRINTER and FREE local and international calls. Our villa has been beautifully landscaped to the front and rear. The pool area is surrounded by flowering shrubs overlooking a large grassed recreational area. The south facing pool has an oversized deck area allowing us to offer four loungers two ottomans and table,chairs,umbrella for your casual dining. There is plenty of space for everyone to enjoy themselves. 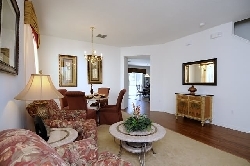 After visiting the Orlando area on and off over the past 20 years when chosing a holiday home location was paramount. We then came up with the hat trick, brilliant location, stunning property and florida sunshine! Windwood Bay is ideally situated with local amenities within 2 minutes at Championsgate, including supermarket, 24/7 chemist, restaurants also offering delivery/take away, McDonalds for those hungry kids! service station and direct access to 1.4 in both directions. Also at Championsgate for those golfing enthusiasts is David Leadbetter Golf Academy designed by Greg Norman and many more courses within easy access. Windwood Bay is close to conservations areas and rural areas. You can walk to the nearby lake Madison where there are tennis and volley ball courts. 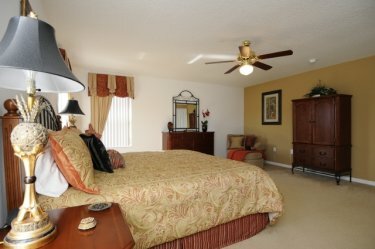 You will be staying on a lovely community in an exceptional villa with easy access to all of the main attractions associated with Florida. We have a highly efficient & friendly Managing Agent and we equally visit our villa on a very regular basis. This ensures both ourselves and our guests receive an exceptional standard of accomodation at all times. 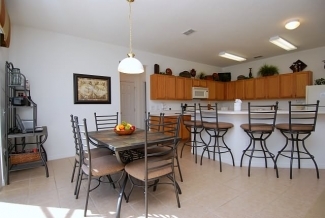 This was our third trip to Florida in three years and we have found an excellent property. 'Wayfarers' it is sited in a quiet area, yet is ideally situated for all the Theme Parks,shopping,restaurants,golf. The house is furnished to a very high standard and is equipped with everything you could possibly need.We looked forward every day to returning to the house knowing that we could relax. I cannot recommend highly enough this property and doubt whether we could find a better one.Many thanks to the owners who have added all the extras which make this property perfect. Very beautiful home, everything was perfect and very clean. We would definitely recommend it to others and stay here again. 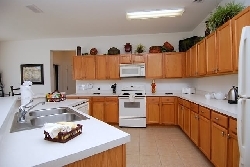 Close to attractions and even great for a fun evening home. Thanks for the security deposit being returned so quickly. I have never been more pleased with a vacation rental in my life. We go on vacation 2-3 times a year and yours was the best ever!! Amazing time here in Florida! We have spent the last 14 days trying to find something this villa hasn�t got and have failed! What a fabulous villa in a fabulous location. The attention to details and all the extra little touches to make us feel at home, were very much appreciated. Your home has exceeded our expectations and has everything you could want or need. We have seen many villas in Orlando over the past years, but this has been by far the best and we will most definitely be back. Thank you so much for letting us stay in your home. We returned from Orlando yesterday and decided to write and express our appreciation for the outstanding villa we rented from you for our vacation. Our children and grandchildren were with us and they too express their appreciation. The villa is large and comfortable, spotlessly clean and perfectly organized. Everything that was promised was provided "and then some" as the Americans say. We appreciated the very clear instruction book including tips for off the beaten track touring (such as Clermont) which was very enjoyable. The small additional items provided (such as a stroller and car seat) are really thoughtful. Your local agent was very pleasant and helpful. He responded immediately when contacted.